So, I made a second trip to Accra, again going to the Ministry of Tourism for a prearranged meeting with senior directors there. I was accompanied by the National President of the Ghana Hotels Association Mr. Herbert Acquaye. I was proudly wearing my Ghana Hotels Association shirt since the association is backing the cause. 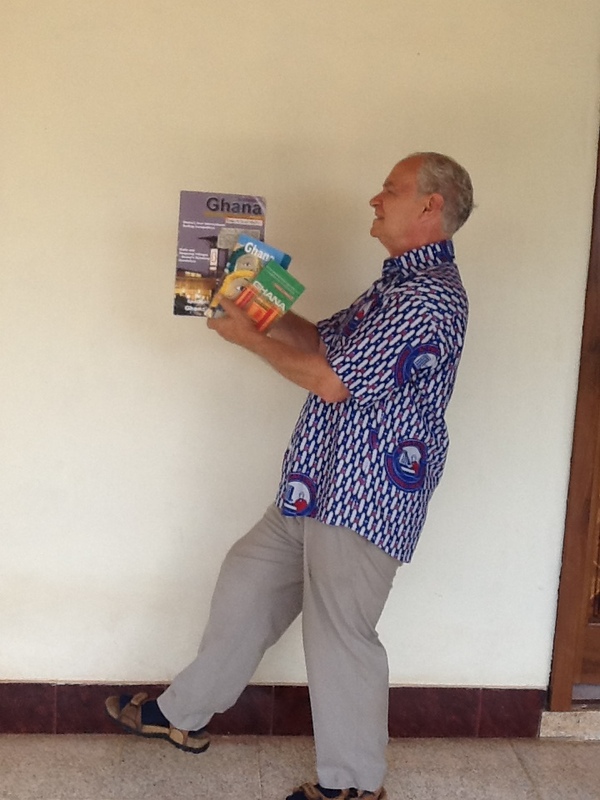 I also went with three celebrations of Ghana, Ian Utley’s Culture Smart Ghana, Philip Briggs’ Ghana the Bradt Guide, and Festus Tumi’s Destination Ghana magazine. And lastly I went with a line from the Ghanaian national pledge “And I pledge myself to the service of Ghana with all my strength and with all my heart” ringing in my ears. The meeting went well. The directors listened and participated on points such as the benefits to industry and nation. Increased tax revenues particularly got their interest, especially when I talked about my timing to start this cause to coincide with the introduction of the 1% tourism levy which will be spent directly on tourism development. We even talked about one of the big stumbling blocks, the revenues generated at the foreign Ghanaian missions. I made it clear that the exemption would only be for tourists staying less than thirty days, not for convention goers which represent the largest component of Ghana’s foreign arrivals, not for N.G.O. workers nor volunteers, nor for business travellers, nor for tourists or people staying over thirty days. I explained that it would be just for short term tourists who in general spread their inputs throughout the country. The discussion went to the competitive aspect of tourism. I prefaced my comments referring to the Business Focus article of June 1st entitled “Why Africa’s strict visa requirements are bad for the economy” shared by three friends on the SCRAP SHORT TERM TOURIST VISAS TO GHANA Facebook group page. I mentioned the numerous African countries that Ghana competes with that have no visa requirements for short-term tourist stays and how Ghana’s tourism revenues pale in comparison to theirs. I mentioned that the scrapping was the ultimate goal of this quest for reform, but that a compromise could be easy access to visas on arrival. Right now, visas on arrival do exist for Ghana but you have to apply for advance permission and they cost US$150 while most other countries on the African continent charge US$50. Think how prohibitive the cost would be for a family of four who show up at Kotoka International Airport requesting visas on arrival! A second, further compromise might be e-visas-quick and hassle free- that would mean eliminating a lot of overhead at the Ghanaian foreign missions. Turkey and Rwanda are two countries that have adopted this system. But the overriding argument for scrapping short-term tourist visas to Ghana would be that because Ghana, that is the Ministry of Tourism, has such a limited promotional budget, it would only make sense to attract visitors through no visa fees for short-term tourism purposes. The directors acknowledged that at her televised vetting the new Minister of Tourism, Culture and Creative Arts Honourable Minister Elizabeth Ofosu-Agyare asked the vetting committee for increased budget allocations. At the end of the meeting I gave the directors their homework-I had previously told them I had been a public servant like themselves teaching for 30 years. The two page front and back had stapled my business card, the letter to the editor that was recently published in the Daily Graphic titled “Rebuild Ejisu Museum“, the June 1, 2013 Business Focus article entitled “Why Africa’s strict visas requirements are bad for the economy and then the front cover of Destination Ghana Spring/Summer 2009 followed by the Message from the Publishers: An Argument: No Visa Requirement For Short Stay Visitors to Ghana. Yes, I’ve been at this since 2009! What’s more I got the directors’ email addresses for follow-up. We have had our first meeting regarding the Scrap Short Term Visas to Ghana. Present were Mr. Edwin Owusu-Mensah, Mr. Charles Osei Bonsu and for a short time Mr Ababio. I look forward to the next step which may involve the participation of The Ministry of Foreign Affairs and the Ghana Immigration Service. I hope that you have a look at the SCRAP SHORT TERM TOURIST VISAS TO GHANA Facebook group page and the Change.org petition on the internet. Attached is my card, a letter to the editor I recently wrote, an article regarding the adverse affect strict visa requirements have on an economy, and lastly a local article on the issue. From the ministry, Mr Acquaye drove me to the VIP bus terminal for the 272 Km drive to Kumasi and Four Villages Inn. ← WORKING AND WALKING FOR SCRAPPING! Ayekoo! A living example of a man being the change he wants to see. Here, here, Festus. Well said.